Grab those crayons, markers, and colored pencils! Turn on the printer, and download this new brachiosaurus coloring page for kids! 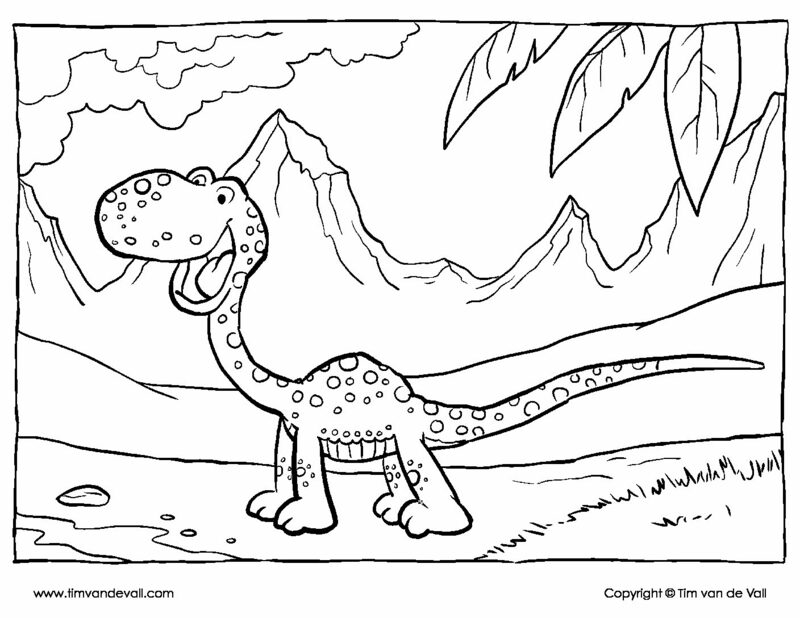 This coloring page depicts a cheerful young brachiosaurus during the Jurassic Period. In the background of the coloring page is a mountain range with volcanos. Visit the dinosaur theme section for more dinosaur printables. If you want more dino coloring pages, I’ve made them for velociraptor, stegosaurus, and Tyrannosaurus rex. The brachiosaurus was a long necked giraffe-like sauropod dinosaur. The term brachiosaurus was coin in 1903 by paleontologist Elmer S. Riggs, who discovered brachiosaurus fossils in Colorado. Scientists believe brachiosauruses were warm-blooded herbivores. They lived about 150 million years ago during the Jurassic Period. Brachiosaurus is often called “Brontosaurus,” a dinosaur which never really existed.